My mother, Wylene, an African American woman in her 50s, never thought she would know much more about her family history than the names of her grandparents. She knew that her mother was from Louisiana, the names of about 2 cousins and an aunt, and a few stories from my grandmother. There was family folklore that the history of our family in Louisiana was in a book, but my mother knew neither the name of the book nor the author. So when I, an amateur genealogist, began to use old government records to develop the family narrative, she was delighted with just how much we were able to learn about our family. Born and raised in North Carolina, my mother knew little about her mother’s roots. What she did know was that she felt disregarded by “her country”. As a result, she placed immense value on embracing her African roots even though she had no idea which African countries her ancestors were taken from during The American Slave Era. Using a range of media, from books in our home to Afrocentric movies on television, my mother taught my siblings and I to embrace our African-ness and Black-ness. A few years ago, with the little information that my mother knew about her relatives, I created an online family tree with Ancestry.com. I also spoke with one of her cousins to try to learn more about the family. At the time this cousin had been searching for years to put together our family narrative, but was unable to access her paper records when I contacted her. Though aware of the mysterious book that held parts of our family history, she could not tell me much more than the fact that it featured the LaCroix family. I’d later come to learn that Mary LaCroix and her husband owned my family a few generations ago, but I’ll get to that later. In my search for additional information, I reached out to other Ancestry.com members who had family tree branches that matched mine. Although they turned out to be distant relatives of relatives, some were very helpful to my search and a sense of camaraderie formed over our common quest to determine our genealogy. Eventually I contacted the Louisiana History Museum in Alexandria, Louisiana and, sure enough, there was a book on the LaCroix family. To my surprise, the administrator offered the personal phone number of the author, E. W. McDonald. On the phone, McDonald was very helpful and shared with me all that he remembered about my family from his book. My family history took up 6 of the 606 pages of his book so he offered to send me a photo copy of those 6 pages. 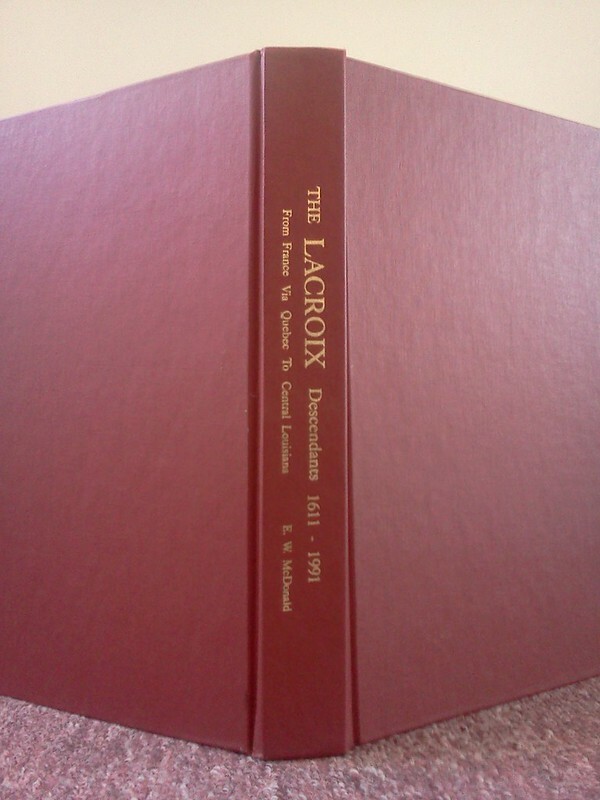 Wanting a full copy for my family, I decided instead to purchase the very last copy of his book: The LaCroix Descendants, 1611-1991: From France Via Quebec to Central Louisiana. Using McDonald’s work, government records, and an acquaintance (relative of a relative) that I encountered through Ancestry.com, I was able to develop part of both mine and my mother’s lineage and narrative. Social psychologists, Peter Fischer, Anne Sauer, Claudia Vorgincic and Silke Weisweiler suggest that people who think of their ancestors tend to reflect on how their ancestors overcame a great hurdle, such as a war or economic ruin, and that people associate the problem-solving abilities of their genetic ancestor to their own problem-solving abilities. Their research indicates that students of a university in Germany, when asked to think of their ancestors from the 15th century to their great-grandparents, had higher academic performance expectations and performed better than the students who were asked to think of a routine topic such as their last grocery shopping trip (Fischer, Sauer, Vogrincic, & Weisweiler, 2011). This is to say that thinking about one’s own ancestors or group history has positive psychological effects with measurable outcomes in academic performance. A person not knowing their ancestors is a great personal loss (Brown, 2008; Fischer et al., 2011). While the process of developing the narrative may be difficult at times, the perception that African Americans cannot discover valuable portions their family history through the American Slave Era is one narrative that needs to be deconstructed. Indeed, it is imperative that African American take this journey. Archivist, Jeannette Bastian argues, “a community without its records is a community under siege, defending itself, its identity, and its version of history without a firm foundation on which to stand” (Bastian, 2003). This is one way to reconstruct a narrative that fosters resiliency. In this new series on CoLab Radio, I’ll share my process of uncovering my family’s narrative and lineage and my thoughts on the power of narratives, even painful ones, to affirm and strengthen communities. Post and image by Lakisha David. As my daughter was sharing all the info she had collected of our family, each time when new info or a relative was revealed, I felt a layer of the torment of slavery just rolled away. Seeing our history unfold, just wash the dust of slavery and the treatment of this society right off my back. I was not aware of the effect slavery had on me, til the unfolding of the life of my ancestors was being revealed. I thank Al-Mighty God for Blessing me with Lakisha and thank you too, LaKisha David. What an incredible story! Thank you. I am looking forward to the next post in the series. This is really inspiring LaKisha, I am Ghanaian and in some way don’t have a direct relation this particularly, but it does open up a lot of issues that I can relate to and maybe would be brave enough to embark on the journey as you certainly have. I look forward to reading the series and sharing in your journey. Thank you to LaKisha for sharing this wonderful journey. Many times have I wondered where I came from, probably being Puerto Rican has not allowed me to fully understand my roots as our nation (and by nation I mean Puerto Rico) has been robbed of its history. I can not say I know what it feels like to be African American, but I do know what it feels like to be desperately searching for a sense of self and belonging in one’s own country. I know what it feels like to be constantly trying to adapt and survive in a world written by somebody else. It takes dignity and great sense of responsibility to have the courage to stand up and look at truth right in the face. It is with great honor that one embraces history written by the people who lost, the minorities, the workers, and begins creating a new path of self-discovery and self-actualization. It’s in that search that one realizes that we were and are worth something, that our roots were well grounded, and that we had all the riches in the world, we just chose to believe in human development, not imperialism. …It is with great honor that one discovers..and walks with a head held high. Thank you, Lakisha, it is with great honor that you and your family did. Can’t wait for the next!!!!!!!!! I think this is so cool. I can’t wait to read more about your journey. LaKisha, this is really interesting! Thanks for sharing the story of your own process and encouraging others to do the same. Excited to read more!